and alerts messages that redirect to fake online scanner. 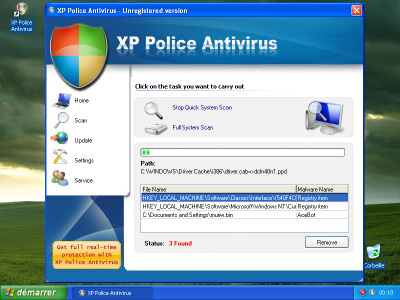 XP Police Antivirus is a new rogue. As always: fake malware detection, lots of alert messages to sell a fake security software. See MAD blog for more informations. Libellés : Rogues, ScreenShots, Sig. New Rogue released: IE-Security. It is using the same GUI as WinDefender 2009 and Total Secure 2009. Libellés : IEDef, Rogues, ScreenShots, Sig. I saw your post in the blog (10-Oct-2008) about my previous message. Just want to say 'Hello' from Russia. You are really good guys. It was a surprise for me that Microsoft can respond on threats so fast. Happy New Year, guys, and good luck! So, you will not see some of my great ;) ideas in that family of software. Try to search in exploits/shellcodes and rootkits. improve some of Vista's protection. It's not interesting for me, just a life's irony. This is a response to Microsoft Windows Defender's Team, which found a first message in a previous binary and post a topic on their blog.